Science Objects are two hour on-line interactive inquiry-based content modules that help teachers better understand the science content they teach. This Science Object is the second of four Science Objects in the Energy SciPack. It provides a conceptual and real-world understanding of how energy is transferred, from object to object and from one form of energy to another. Although the various forms of energy appear different, each can be measured in a closed system. This makes it possible to keep track of how much of one form of energy is converted into another form. Most of what goes on in the universe—from exploding stars and biological growth to the operation of machines and the motion of people—involves some form of energy being transformed into another form. The law of conservation of energy states that whenever the amount of energy in one place (or form) decreases, the amount of energy in other places (or forms) increases by the same amount. I really enjoyed this SciPack. It really broke down how to explain the transfer of energy. I teach 3rd grade and even though we deal primarily with heat and thermal energy this sci pack is still a good way to introduce potential and kinetic energy. The transfer of energy often leads to the involvement of thermal energy. This is a good way to introduce this to my students even though we don't go over in detail this topic. I really enjoy Science Objects. In 1-3 hours, the Energy: Energy Transformations Science Object will help me re-learn, refresh, or learn for the first time some critical science concepts I will have to know to obtain my Science Educator credentials. I appreciate that I can complete them at my own pace, and that, if used as park of a SciPack, I have access to a content expert to go to for help. The NSTA Learning Center Science Objects are really beneficial! Very informative. 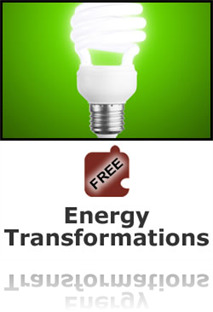 The most comprehensive approach to teaching energy transformation to all ages and for both educators and learners. This Science Object was just wonderful. I don't know how else to say it. It was clearly one of my favorites out of all of the ones I've done so far. I found myself engaged through the whole object! This Science Object was clear and concise! It gives the seeker of knowledge a good idea about the law of the conservation of energy (how it works, what it means and a frame of reference for how to apply it). This Science Object also puts the calculation of PE and KE into its applicable context; great simulations and explanations! A great visual display of energy transformation! My students will benefit immensely as they map energy flowing through a closed system. The thought provoking questions forced me to address my currentmethod of instruction fof this topic. This is an excellent resource for novice and intermediate learners. The animations are frequent and really good, and the follow-up questions really gets the learner to think. Transformations lead easily to the Law of Conservation of Energy and this Science Object does a great job. This SciObject provides content information and activities about how energy changes from one form to another. It contains animations, simulations and embedded assessments so teachers unfamiliar with the concept can enhance their understanding. This series of SciObjects (or the SciPack they are in) is one of my favorites because it helps make an abstract concept much more concrete. It would make a good review if you haven't had to teach these concepts recently as well. Conservation of energy is a difficult concept . This science object helps through interactive graphics and good questioning techniques to build upon this understanding. Key concept in understanding this rule in closed systems is explored. As an elementary teacher, most of us have reading or math certs, so this is very helpful. Useful ideas for the classroom too. The paragraph was informative. It provided me with a more in-depth look when it comes to energy. As I worked through the sections, I noticed that some questions required more than 1 correct answer. I was wondering why my responses would have an 'x' and '/' mark. I needed to find another right answer. Overall, this is an awesome resource to review and reinforcement energy transformations. I especially enjoyed the audio dialog; this benefits students requiring assistance in reading. Examples were awesome because they included diagrams to assist visual learners. I enjoyed the interesting facts boxes as an additional resource. I feel that this resource would be appropriate for regular or students requiring modifications since some students are aware of other types of energy and this section emphasizes on kinetic and potential energy. This object was above-grade-level for my class. It was informative, but the most they could handle is a simple explanation that energy is never lost (universally or in a closed system), and that it transforms. An explanation of kinetic energy, potential energy, and the calculation of KE would be a bit much for them. Nice presentation but I would have also liked something I could more easily adapt to my grade level. Good information to know. I wish there was a certificate of completion I could add to my portfolio! Interesting material but this resource does not enhance my kindergarten curriculum. As a professional development course I am less than pleased to spend my time on a subject and material that I am unable to use in my classroom. What relevance does this have to my kindergarten standards?